Trail head entrance from Onion Creek Drive. Directions: To get to Onion Creek park in south Austin, exit from IH 35 onto William Cannon Dr. and head east, passing the HEB on your right. Turn right on Pleasant Valley (you will see a Texaco Gas Station) and take the first left onto Onion Creek Drive. Stay on Onion Creek Drive. The road dead ends into the park, so if you want to avoid having to back up your rig to exit the area, then park before the intersection of Onion Creek Drive and Vine Hill Drive or turn right on Vine Hill Drive to park. When exiting then you can follow Vine Hill Drive, turn right onto Thatch Lane, and turn left back onto Onion Creek Drive which will take you back out of the park. There is no designated parking area, so you just have to pull over to the curb and park on the side of the street. The park roads are wide and have little traffic. 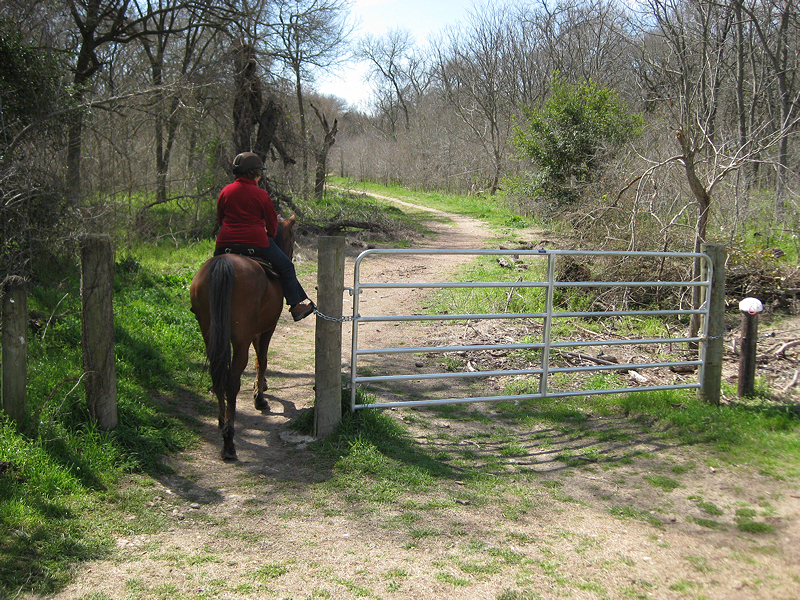 To get to the trail head gate from where Onion Creek Drive dead ends into the playground area, ride to the left of the playground down the dirt path and turn right by the metal gate to pass through an opening between two wooden posts. Click this map to enlarge it. 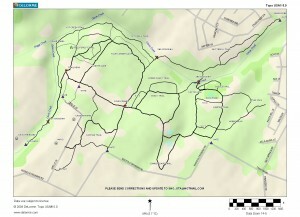 Notice the Onion Creek Drive trail head is in the upper right corner of this map. 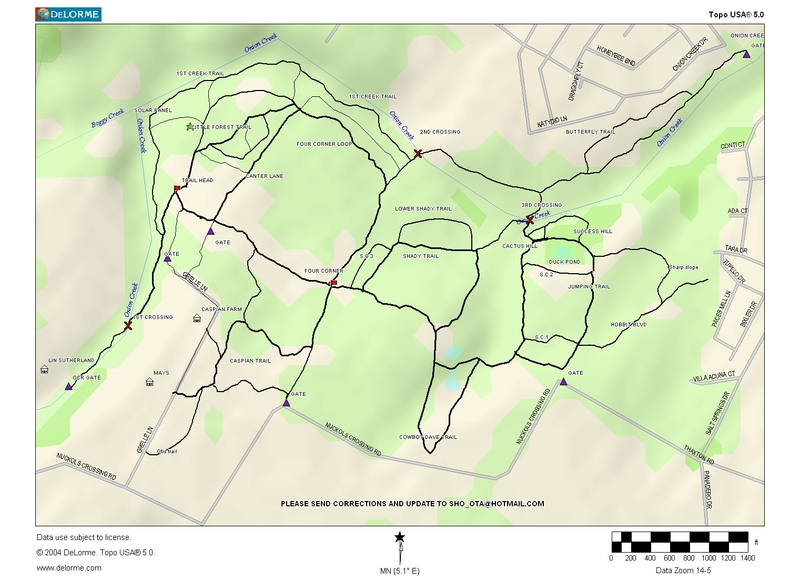 Trail Map: A trial map was found on the web and is listed here, click the map to enlarge it. The main trail leads to the creek (labeled 2nd crossing on the map. Be careful on this creek crossing, there is an object on the left side of the trail sticking out of the ground just before entering the creek which could injure a horse. You can go to the right of this crossing for a steeper but safer trail down to the creek or even better before coming to this crossing take the trail branching off to the left to get to a safer creek crossing (labeled 3rd crossing on the map). After crossing the creek the park opens up to a wealth of unmarked trails. 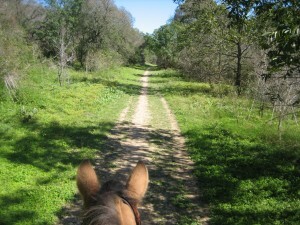 I have not yet ridden all the trails but would estimate there to be at least 12 or more miles of trails. The majority of trails are wooded with thick vegetation. 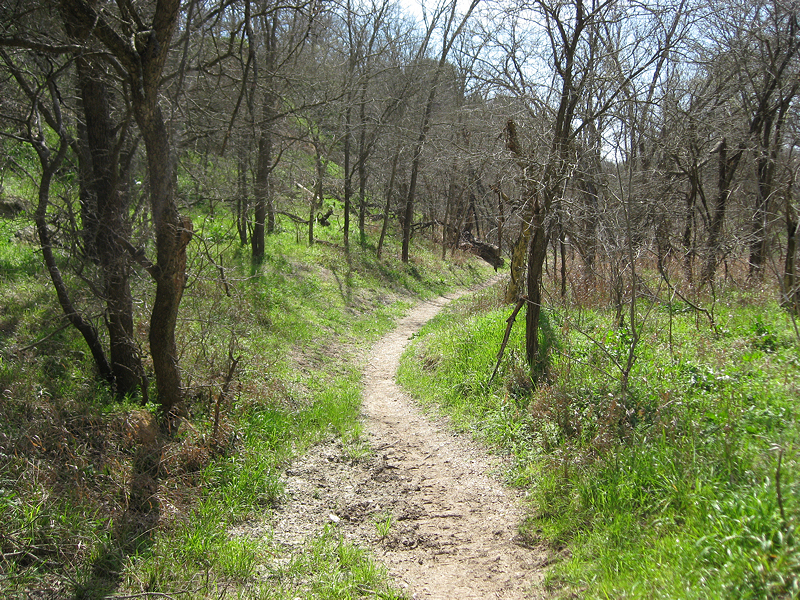 I imagine the trails will be thick with wildflowers this spring, especially if we keep getting much needed rain. Outside of the creek crossings, most of the land is flat with some mild inclines. The trails are slightly rocky in some areas, especially in the creek bed. This park borders a few boarding facilities, private properties, and some residential neighborhoods. On my first trip there Carol and I enjoyed exploring the trails, although we got turned around a bit being our first time out, we still managed to find our way back with out too much difficulty. 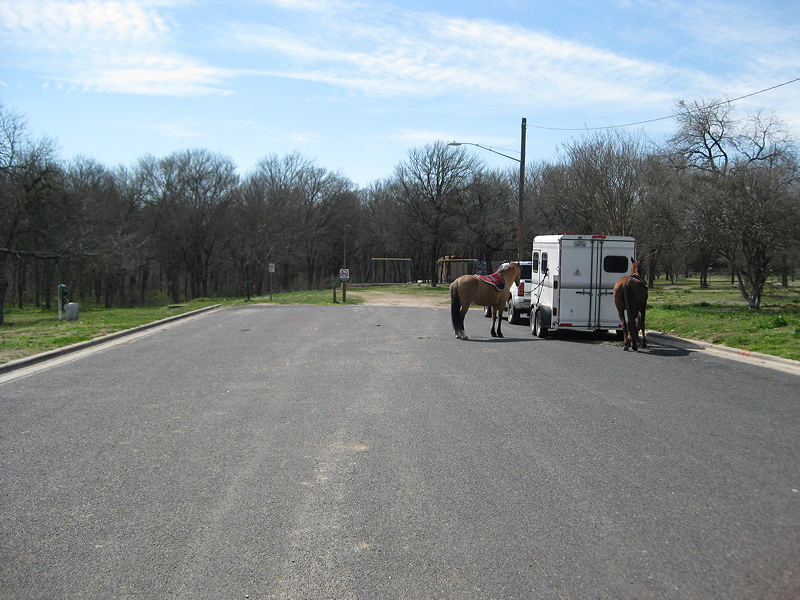 On another trip to the park we crossed paths with several friendly trail riders who board their horses in the area. 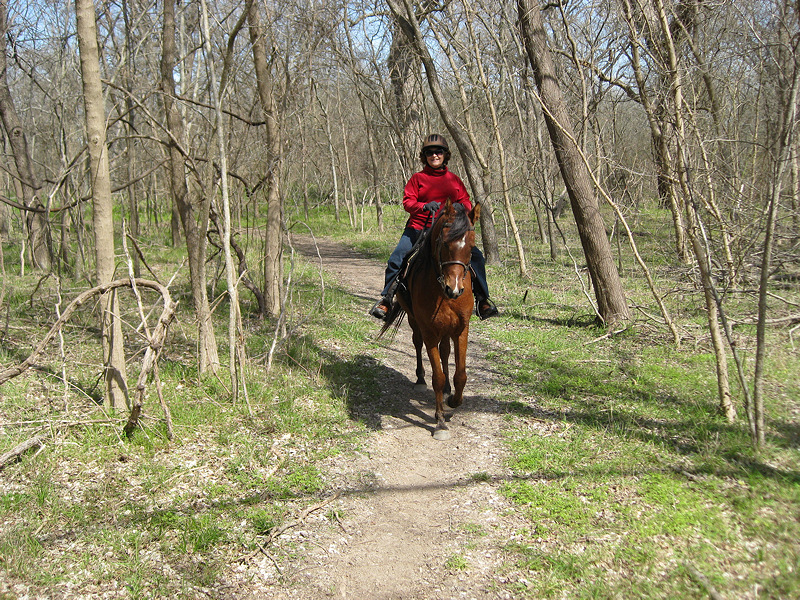 One of the riders on a smooth gaited horse kindly gave us a tour of some of the trails. 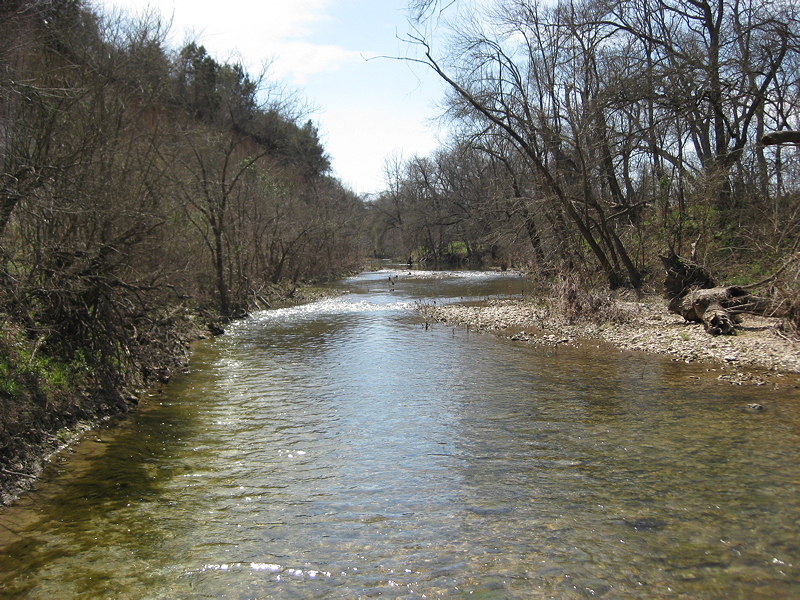 My most recent ride at Onion Creek was in November of this year. 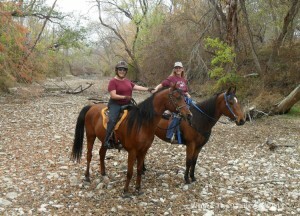 Carol and Shirley joined me and we bumped into some of our friends also out riding and enjoying the park. 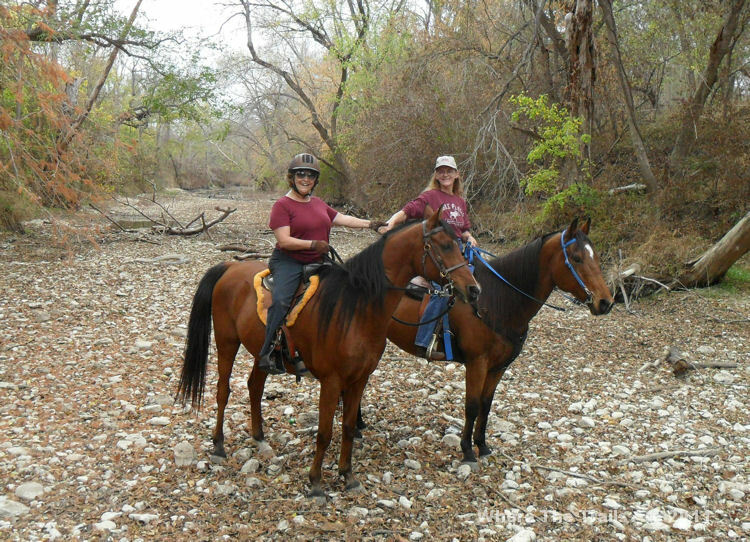 During this ride the creek beds were mostly dried out and covered with various shades of brown and amber leaves. Riding at Onion Creek has many upsides such as no fees, lush vegetation, shady trails, water crossings, friendly fellow trail riders, and many trails to explore. The downside to the park includes the lack of an adequate trail head and dedicated parking area, trail markers, and facilities. There is no running water, hitching posts, or restrooms. I also recommend staying on the well traveled trails. Riding off trail or any area where you cannot see the ground because of tall grass could be dangerous due to hazards caused by trash. You can call 311 to report dumping. 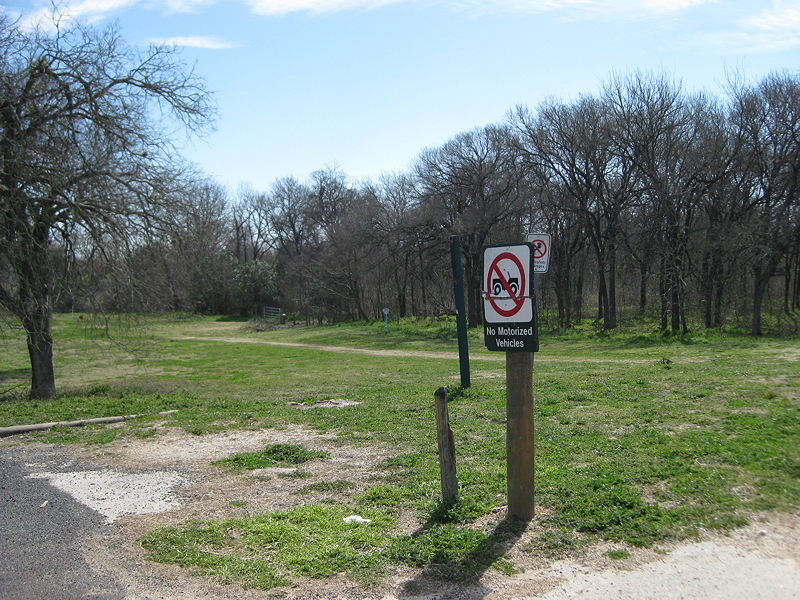 Fortunately the main trails are mostly clear of trash, thanks to Friends of Onion Creek Park, a group that organizes clean up days for the park. Visit or “like”Friends of Onion Creek Park ‘s FaceBook page to get updated information on the park and learn of opportunities to volunteer at the next clean up day. Working together to keep the trails clean is essential to preserving safe and pristine areas to ride. 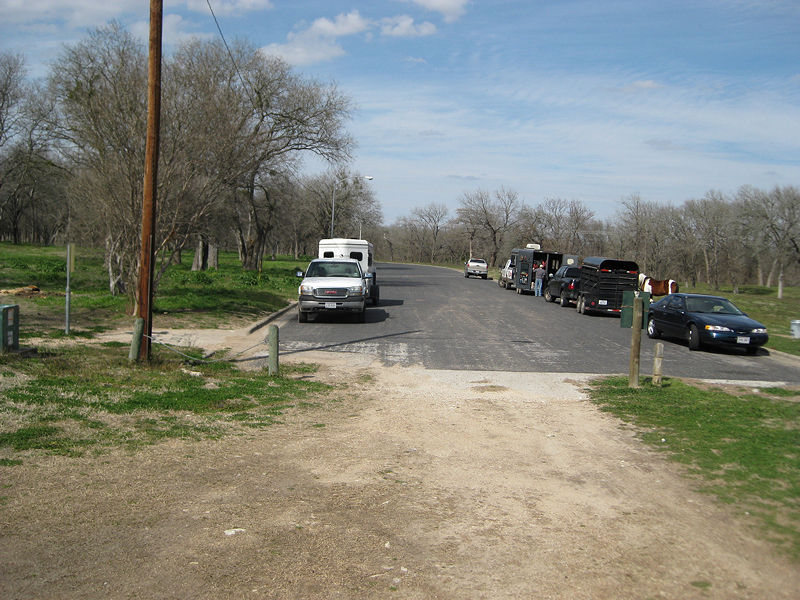 Onion Creek Drive dead ends into the park, Feb. 2010. Facing the park from Onion Creek Drive go left and turn right between the two posts to begin your ride.